If your dog or cat suffers from bad breath this may indicate that they have a problem with their oral health. Until now the only way to keep your pet’s teeth clean was by daily brushing. However, this can be difficult to achieve. ProDen PlaqueOff™ Animal is a new and easy way to improve your pet’s oral hygiene. Why do I need to clean my pet’s teeth? As in humans, plaque bacteria constantly forms in the mouth and can accumulate on teeth, gums and the tongue resulting in bad breath, gum disease (bleeding gums), tartar and tooth decay. If it is left untreated this can lead to pain and unnecessary or premature tooth loss. What is the best way to keep my pet’s mouth healthy? Thorough and regular cleaning removes plaque bacteria before it can accumulate and cause inflammation and damage to gums and teeth. Plaque can also turn into a very hard substance called tartar. Once formed, tartar is very difficult to remove. Tartar removal is usually a veterinary procedure. Unfortunately plaque is constantly forming and so brushing on a daily basis is needed to control it effectively. ProDen PlaqueOff™ Animal is a new innovation in pet dental care now available in the UK from veterinary practices and other selected outlets. Used daily, it can significantly help in the control of dental plaque, tartar and bad breath. What is ProDen PlaqueOff™ Animal ? ProDen PlaqueOff™ Animal is a completely natural product. It is a special type of seaweed which has been found to have specific beneficial effects for oral care. It comes in a granulated form which is easily added to food every day. It is rich in natural iodine and contains important vitamins and minerals and is free from artificial colours, preservatives, gluten and sugar. Unlike other methods of plaque control ProDen PlaqueOff™ Animal works systemically i.e. through the blood stream. It is thought to affect the ability of plaque to ‘stick’ to surfaces in the mouth and softens hard tartar deposits. Improvements should start to be seen between 3 and 8 weeks. How should ProDen PlaqueOff™ Animal be used? This depends on the size of your pet. For small dogs (up to 10kg) and cats a pot will last up to a year, whereas for large and giant dogs one pot will last around 3 months (average supply based on a 60g pot). There are no known side effects, however, due to the rich iodine content of seaweed, this product may not be suitable for animals undergoing thyroid treatment. If unsure, consult your vet for advice before starting treatment. Iodine is important for thyroid function and is naturally present in seaweed, including the type used in ProDen PlaqueOff™. There is no evidence to suggest that high levels of iodine actually causes hyperthyroidism, as the body has feedback mechanisms to cope with varying levels. Only very low or incredibly high levels would pose a problem, and PlaqueOff doesn’t fall into these categories. 1 scoop of ProDen PlaqueOff™ Animal contains 131.1 microgrammes of Iodine. If your pet is known to suffer from hyperthyroidism then we suggest that you do not use ProDen PlaqueOff™. If you are unsure then please contact your veterinary professional for further advice. My cat / dog is very fussy, what if they won’t eat it? If you are having a problem, try hiding the dosage in a treat or splitting the dose over two meals in the day until your pet is used to it. My dog / cat hasn’t got any plaque, why would I need to use this? People often tell us that their pet doesn’t have any plaque. Whilst your pet may not have any obviously visible plaque or tartar, they will have plaque in their mouths. Plaque bacteria are naturally occurring in the mouths of all animals (including humans) and begin to form a sticky coating across the teeth almost immediately after brushing. Some people / animals have more plaque than others and so, it is more obvious in some people / animals than others. 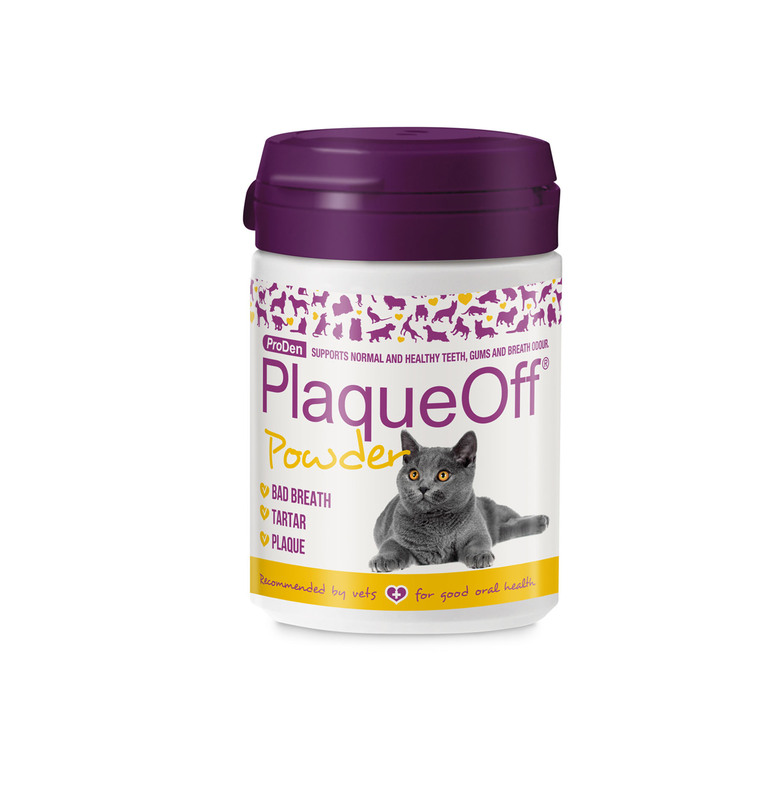 Even if your pet doesn’t have any visible plaque or tartar (which forms from plaque bacteria) ProDen PlaqueOff™ can be used to prevent any problems with build up in the future. After all, tartar takes time to accumulate and doesn’t usually appear overnight! My cat / dog is already on a kelp diet / seaweed supplement, can I give them ProDen PlaqueOff™ Animal as well? Yes. The size of the dose of PlaqueOff given is very small and would make no significant difference to the total seaweed content of the diet. Again, because of the dose size, PlaqueOff on it’s own however, would not give the same benefits as a full kelp supplement. The species of seaweed in the various products available are different and it is the Ascophyllum nodosum in PlaqueOff that has been found to be of benefit in terms of reduction of plaque and calculus. There should not be any issues with feeding different seaweed species at the same time. Can I give my cat / dog ProDen PlaqueOff™ Animal if they are on medication? There is nothing in the contents of PlaqueOff, (which only contains granulated seaweed) that would be likely to cause unwanted reactions. It is currently being used with cats and dogs that have heart, liver, kidney, bowel and other disorders. However, if you have any concerns, please consult with your veterinary professional. I've tried this the 1st time, is useful. It controlled my dog breath odur and tar tar.